… is a shared vision originating from ancestral lineages throughout the Americas. It is a vision that does not fight against the current system, but fights for a new human society that can be aligned with Nature. 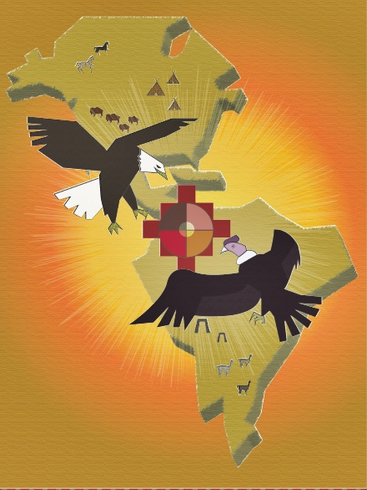 The union of the Eagle and the Condor is an authentic prophecy handed down through traditions of the Americas. ​It foretells the uniting of North and South, East and West, tradition and modernity, intellect and heart, and masculine and feminine. The prophecy calls for the establishment of a new society which unites Sky and Earth – where spiritual fulfillment is met through responsible stewardship, integrative social projects, and healthy personal relations. The Sacred Wheel is a universal archetype that will permit the Prophecy of the Eagle and the Condor to manifest. The internal structure of many ancestral traditions, we can also observe it in nature as a sphere (e.g. the sun, the moon). The Sacred Wheel permits us to see Life as both One and Different. This basic archetype of life is known by other names, such as the Cosmovision. In the Andes, it is depicted through the Chakana. Learn more about the Sacred Wheel and how we apply it in our community life and formation progress. ​Why is our project based on the Sacred Wheel? We work with the Sacred Wheel because it is a sacred structure of nature and tradition. We want to align ourselves with this living structure in order to be in harmony with Nature, and express its superior potential. The Sacred Wheel teaches us that Life is both One and Different. We can discover our diverse identities within the inclusive whole, where our differences are complementary rather than conflictual – an essential medicine for the modern world. We can apply these teachings to projects and relations to awaken consciousness, seeing how communities, organizations, and fields of study can collaborate in a global project. Forty-five years ago, our community-project founder first encountered the sacred path of Life through the Vedic tradition of India. After 20 years dedicated to this practice, he was visited by Abuelo Tobacco in dreamtime. These dreams awakened him to his connection with the Red Path of America, leading him to encounter medicine people of various traditions: the Lakota and Cheyenne of North America, the Toltec of Mexico, the Shuar of Ecuador, and the Piaroa of Venezuela. Through these traditions, he received initiation in the shamanic path and authorization to serve it on the basis of the Sacred Wheel. This journey gave birth to our community project, established two decades ago, with the intention of developing an education center based on the universal structures of Life and ancestral tradition. Over the last 10 years, many inspirational people from around the world have been drawn to the vision of serving Life together through our community’s project. We are committed to re-discovering Life’s sacred sciences through shamanism, and have developed a leadership formation process that can be applied to fields such as ecology, natural medicine, and psychology. Our official NGO, Proyecto de la Rueda Sagrada, was founded by core members of our community five years ago. Today, the circle continues to expand, integrating more inspiring people and branching out through international collaborations. Our unique lineage is a sacred union of two complementary ancestral traditions: the Red Path of the Americas (including the Lakota, Toltec, Shuar, Piaroa, and Andean); and the Vedic-Tantric Path of India. We have been authorized by masters of both traditions to transmit the identity of each one and the dynamic between them. This lineage guides people to an inclusive vision of Life that helps each discover their own personal path. We can be taught by the sacred spirits to live their wisdom in community, and apply it to projects that are in service to all beings.